Roman Moges Asefaha is a Rural Development and Gender Specialist who has been involved for over 20 years in the area of development, particularly project management and policy/strategy development. 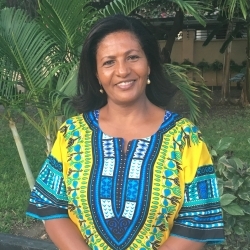 Her expertise includes project planning, monitoring and evaluation, organizing and leading participatory project identification and formulation exercises, institutionalizing gender aspects, organizing surveys and facilitating capacity building trainings. She has considerable experience working with both government and non-governmental organizations in the sectors of Economic Development, Agriculture, Food Security, Good Governance, Gender and Environment. Representing Caritas International Belgium, she has coordinated the design and implementation of shelter and livelihood projects for communities affected by typhoon Haiyan in the Philippines. Recently, she has been a team member of a mid-term review for a Horn Africa Climate change program (HOA-CCP). She has worked for a variety of international and bilateral institutions including Caritas International Belgium, Irish-Aid Ethiopia, UNICEF Ethiopia, European Union (Ethiopia) and Dutch Ministry of Foreign Affairs. Roman has Asian and African level experience in facilitating program designs in a gender-mainstreamed manner.